In the beginning, RDZ Industries models leapt fully-formed out of my mind and into Milkshape 3D… And, well, you could probably tell. The process has changed significantly since then, and now involves a lot more paper. Of course, designs drift as they go from sketch 1 to Milkshape to sketch 10 and back to Milkshape again — but that’s what they’re meant to do, until after some kind of creative natural selection they converge on the most satisfying results. One of the relics I retain from my previous employer is an A4, lined, hard-backed notebook. I think they intended me to take work-related notes in it, but an equal combination of boredom and stress found a somewhat different outlet over my tenure there, and eventually flourished to cover just under a hundred pages. 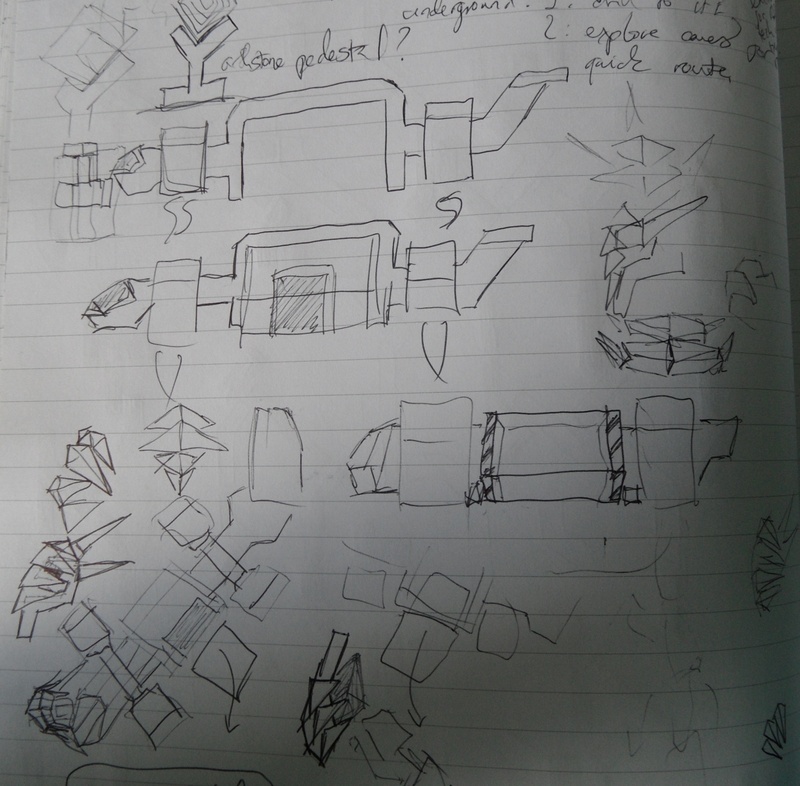 That’s about half-way through the pad, and not being one to waste paper, I’m still using it. This notebook has been with me for about half of Project Y4‘s ever-increasing development lifespan. 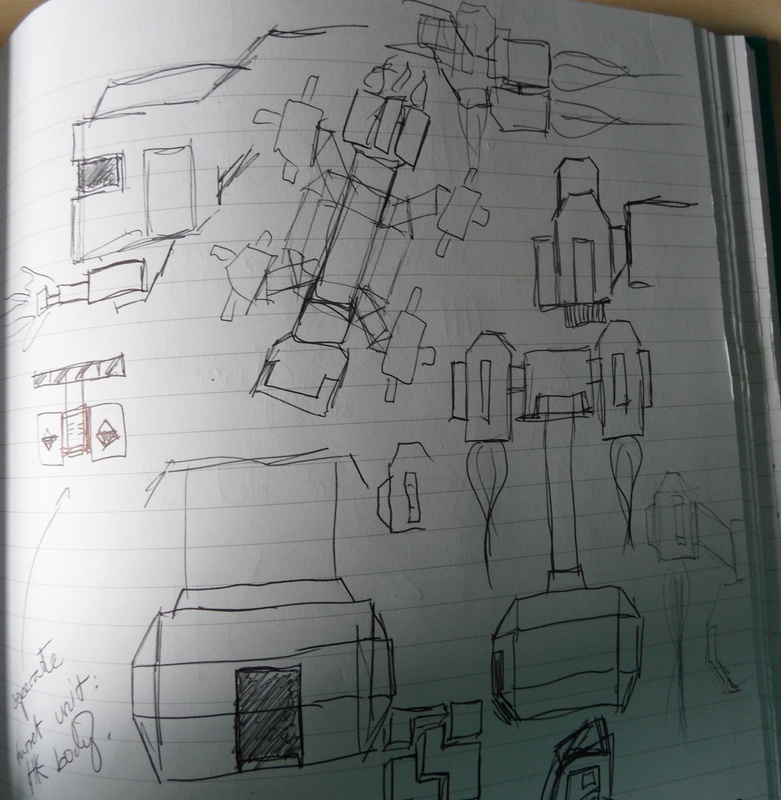 It contains as many mad ramblings and ideas that never made the cut as it does prototypical visions of the models I’ve finished. 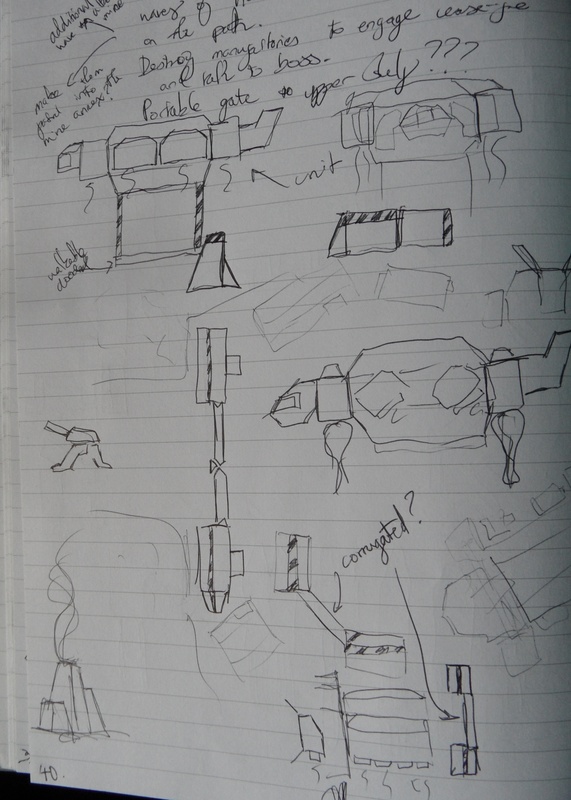 Initial designs for the HoverCon Porta-Factory and other props. 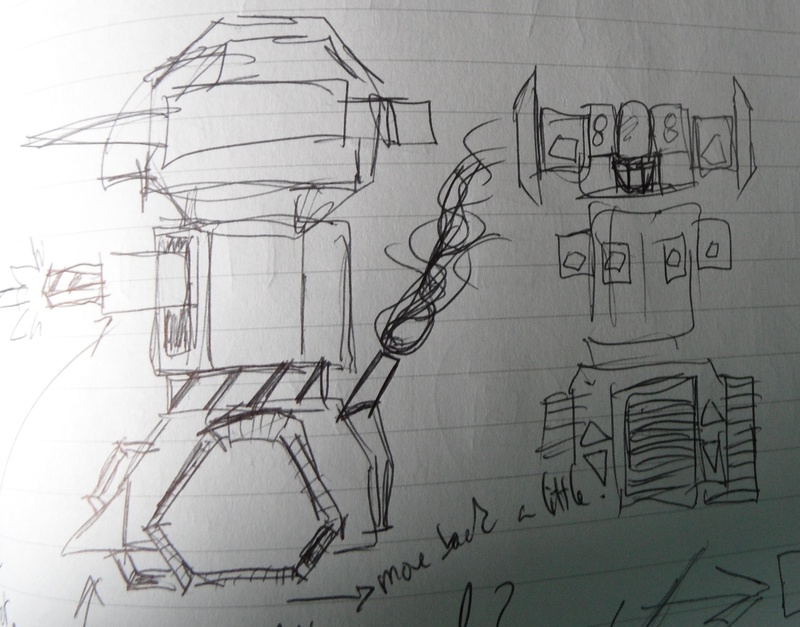 Honestly, how hard can it be to design four engines carrying a giant crate? Finally settled on a decent look for the jet and the factory unit. 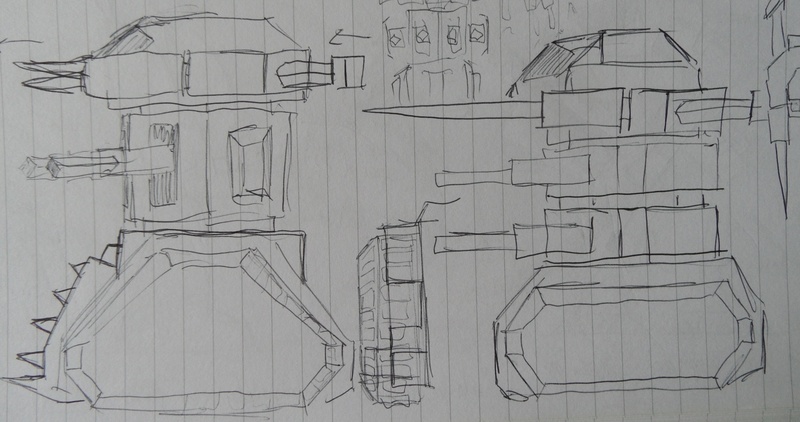 The chin turret hasn’t made it into the game, though. 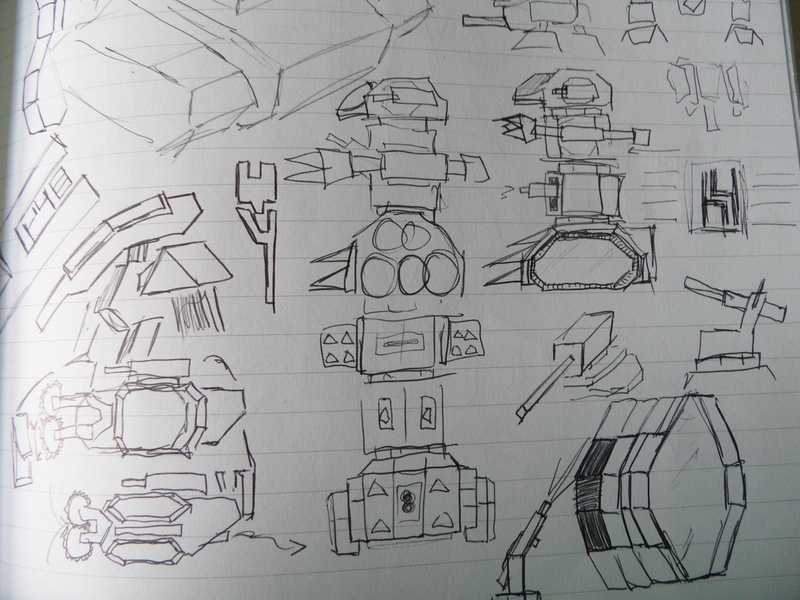 Even though the G1 Mogul was an old design, as the final boss of the G1 assault segment it had to be a counterpoint to the AP-AM — it needed to grow a melee attack. I finally gave up on trying to give G1 vehicles wheels and brought in caterpillar tracks. If Warcraft was more flexible, the double-turret midriff would have been amazing. As a mobile assault force, G1 needed some mobile props. 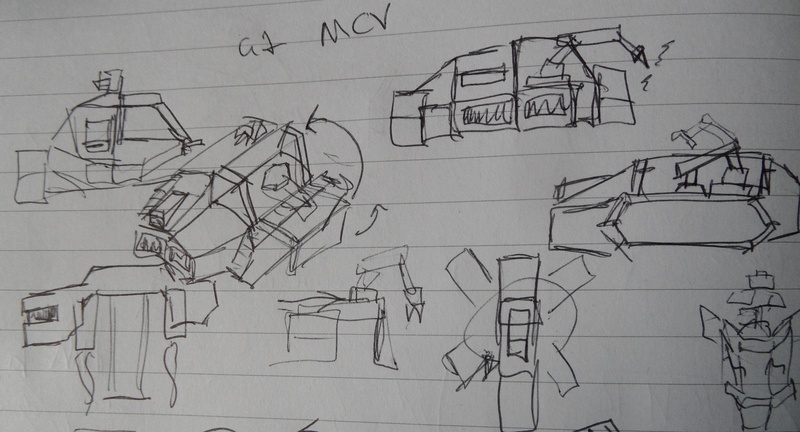 I looked to the Command & Conquer: Tiberian Sun MCV. Mine doesn’t fold out quite so much. 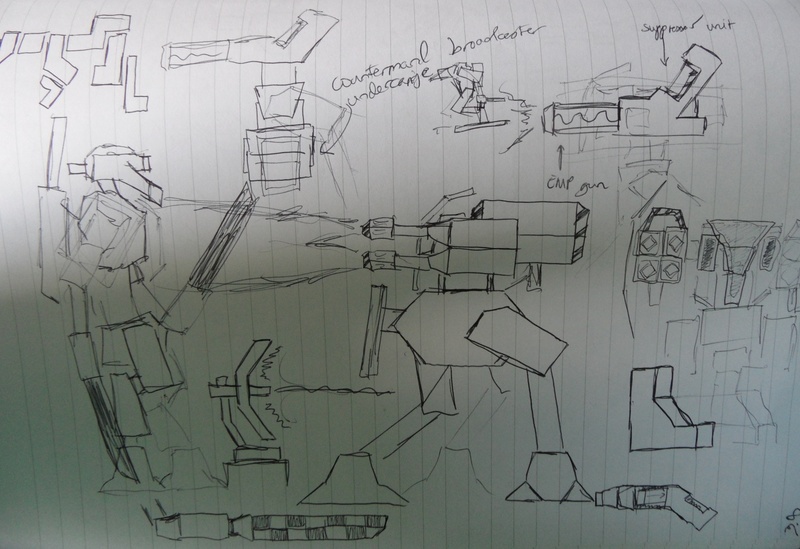 Countermeasure hasn’t actually changed that much since his initial sketches. 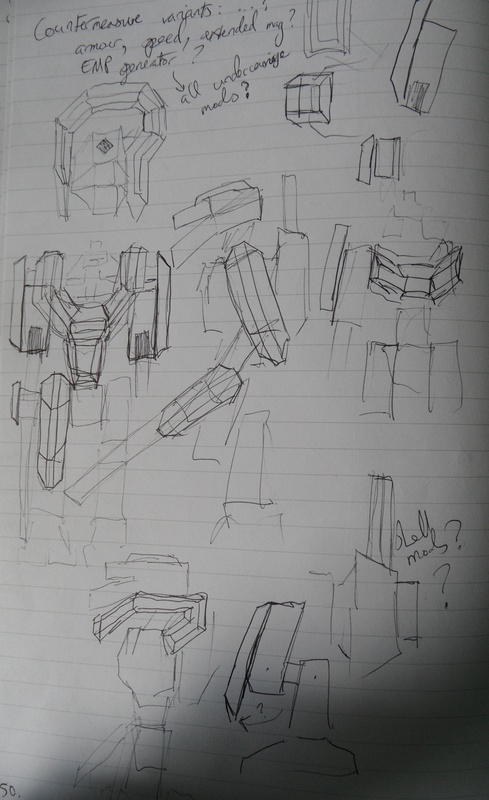 These even include the shoulder pads that would eventually go into his Armour-Up mode — which wouldn’t actually come into existence for another 48 pages. Countermeasure held stable, with his head being the only point of contention (here he grew the crest and the third eye). And the Firegun Alpha… Well, I think that was inevitable. A huge suite of heavy plates turns Countermeasure into Countermeasure Armour-Up, but there’s still no evidence of the explosive splash-damage Thaelite Axes he now carries. The AP-AM bracelets and anklets were going to be much more detailed, then I realised that the AP-AM has considerably stubbier forearms and shins than this drawing would like to think. Proportions have never been my strong point. 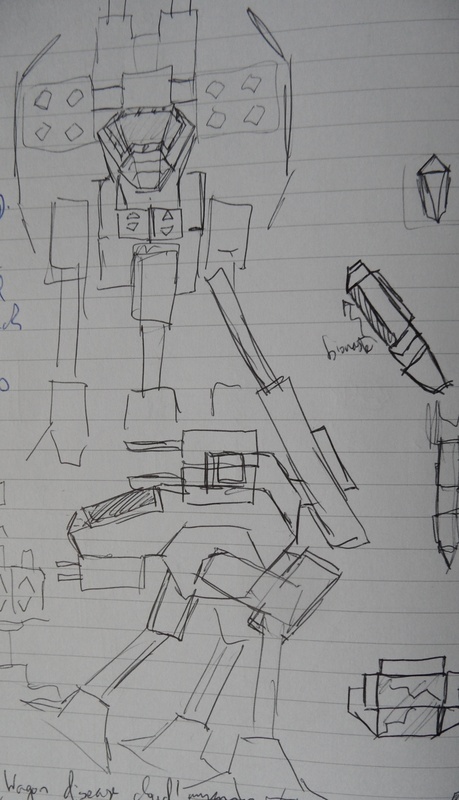 Before Firegun settled into a light mech chassis and a heavy turret, there was a peculiar mobile turret hybrid on the table. 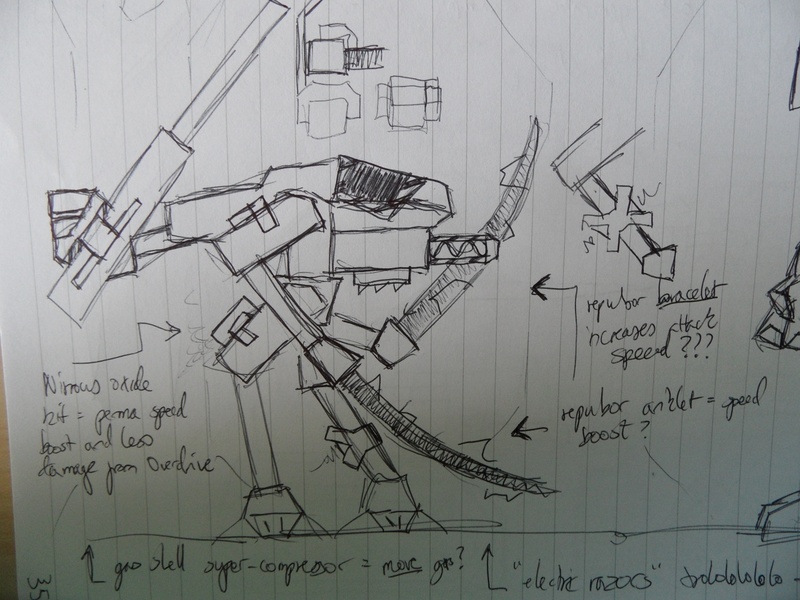 Unfortunately, one of the major design nightmares I can’t show you, because he’s a collossal spoiler. I drew him a stupid number of different ways, modelled him at least three times, and eventually canned the whole lot because I just couldn’t make him work. We can talk about him once the project is finished. 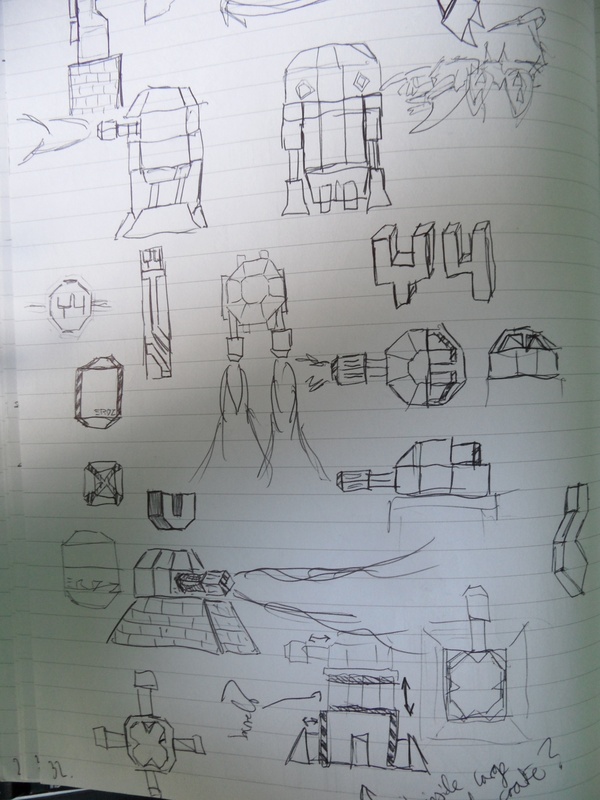 This entry was posted in Modding, Warcraft III and tagged concept sketch, project y4, rdz industries by Rao Dao Zao. Bookmark the permalink.